UNITED NATIONS, September 15 -- The UN Secretary-General's townhouse, on 57th Street and Sutton Place, has been lavishly renovated. 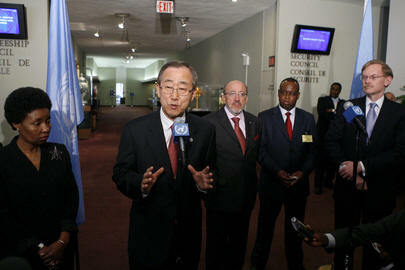 Ban Ki-moon moved in from the Waldorf-Astoria last weekend, ten days before the upcoming meetings, including on climate change, of the new General Assembly. "I wanted to address this global warming issue after having addressed house warming issues," Mr. Ban said on Friday, when he invited the press and his Under Secretaries-Generals, including from the UN Development Program. UNDP has been loudly asserting its autonomy from the UN, particularly on matters of ethics and whistleblower protection, so Inner City Press took the opportunity to ask some questions of UNDP Associate Administrator Ad Melkert, who has not done a press conference in months, speaking only to the Dutch press, and then only off-the-record. No such request was made on Friday night. Mr. Melkert said he had previously been to this house, that while the curtains and Korean mobile partition were among the differences, the structure is the same. Speaking of structure, Inner City Press asked, what are the steps for UNDP to assume its position, as promised by absent Administrator Kemal Dervis, under the structure of the UN Ethics Office and to come, as it were, into Ban's house? This is not about the issue itself," Melkert said, "but a broader governance issue... Keeping the governance of the Secretariat in itself, you have more flexibility around it." UNDP's flexibility has, according to the UN Ethics Office's Robert Benson's August 17 memo, included prima facie retaliation against at least one whistleblower. Since then two other whistleblowers have asked the Ethics Office for protection; others are watching. "So why doesn't UNDP just accept the Ethics Office, as Mr. Benson urged, 'for the good of the UN'?" Mr. Melkert's answer alluded to the creation of the UN funds and programs; he said that "in the General Assembly, there are member states adamant" about keeping UNDP independent from the Secretariat. We'll see. With the question of UNDP providing more than double the funding to Latin America than to Africa hanging in the air, former Special Advisor for Africa Ibrahim Gambari came over, joking to Melkert that if the mountain won't come to Mohamed, Mohamed must come to the mountain. Once Myanmar had been raised, Mr. Gambari mentioned that the UN's Resident Coordinator, UNDP's Charles Petrie, had come to see him. In obeisance to its understanding of unspoken UN rules, Inner City Press will not for now report on the Myanmar musings that followed. As Mr. Ban said of the townhouse, there is a library and other areas, "to engage in informal private dialogues." Yes it is a UN house. Chef de cabinet Vijay Nambiar came but quickly left, with much left to be said. Peacekeeping's Jean-Marie Guehenno was there, as was Management's Alicia Barcena, ever with the populist touch, speaking with the Aramark wait-staff brought north from the Delegates' Lounge. Wine and cocktails flowed, along with roasted eel sushi and a noodle dish which drew rave reviews. "My wife and I are well taken care of," said Mr. Ban, who has himself joked that he has been called "Slippery Eel." Friday he loosened up, saying that a correspondent's gift of North Korean ginseng tea won't get him special treatment and, of carbon offsetting, saying the question was unexpected but that offset's in the future. Later in the evening, Inner City Press asked the head of the UN's Office of Internal Oversight Services, Inga-Britt Ahlenius, about the UNDP stand-off. Ms. Ahlenius answered cautiously as always. She has said that questions can be asked and answers quoted, "I won't always be able to give you the truth but I will not lie to you," she said. "There are people who want to nail me on formal issues but I will not give them that opportunity, I came here to do some job." She advised the press to "take up the lack of transparency collectively." When asked by a reporter, "Are you are frustrated as we are?" Ms. Ahlenius deadpanned, "I don't know how frustrated you are." Ms. Ahlenius said that "everything there is a scandal... in the large UN family," there is a call for giving the Secretary-General "line authority over the funds and programs." So why hasn't it happened? Turf wars, apparently. This time it is squarely raised, and right before the GA General Debate. Mr. Ban will be inviting member states' Ambassadors for another housewarming on September 18. After that, he said, in little over a week he will meet with over 100 heads of state and government, by starting early and staying late. This work ethic is to Mr. Ban's credit, and while his advisors and staff have unique views of off-the-record, even when no request has been made -- we are endeavoring for peace on this issue, the current restraint being part of that -- Ban himself praised the press for its "efforts to connect the UN activity, what it is doing, to the outside world. I hope you will continue to do so." On that, while UN Humanitarian Coordinator John Holmes had been scheduled for a press conference at four p.m. on Friday, subsequently cancelled, to launch a flash appeal for Nicaragua, he was accessible three hours later, with stories of flying to remote parts of the Congo and staying in the "inaccurately named" Grand Hotel in Kinshasa. Inner City Press asked if Holmes chafed, as a former diplomat, at his new focus on humanitarian issues. Holmes indicated that now, rather than defending British foreign policy, he is more free to speak. And of a Sri Lankan minister's outlandish charge that he is a terrorist, for saying Sri Lanka is one of the most unsafe places on earth for humanitarian workers? Holmes replied, "I could have said more." So could we.